We are having a CELEBRATION and YOU win the prizes! We are also having a Blog Hop so you can get lots of great inspiration from the Designers. The Blog Hop Winner will be chosen from comments left on each of the Designers' blogs and on the Scrapy Land Challenge blog. You have until Nov 4 to join our Scrapy Land 100th Challenge Celebration. Beautiful creation! Thanks for a chance to win on a wonderful blog hop! So fun. Absolutely gorgeous!!! The garden frame die is so pretty and the butterflies are beautiful! Such a wonderful design! What a perfect card for the 100th Challenge Celebration. It has such a vintage feel. I Love It! I am a new follower. Pretty card! Love those beautiful butterflies! Very pretty card. Great job. Love your vintage looking celebration card Sherrie! The colors are so pretty and I love that die you used too. Your card is stunning! It's so beautiful what a fantastic job! Beautiful card celebrating this special occasion! Awesome idea to have the vintage look on your card for the 100th Celebration! Beautiful card! Beautiful card. Love the vintage look, so perfect for the 100th celebration. What a beautiful celebration card! Happy 100th! What a gorgeous way to celebrate the 100th challenge! Love all the gold and those pretty little butterflies. 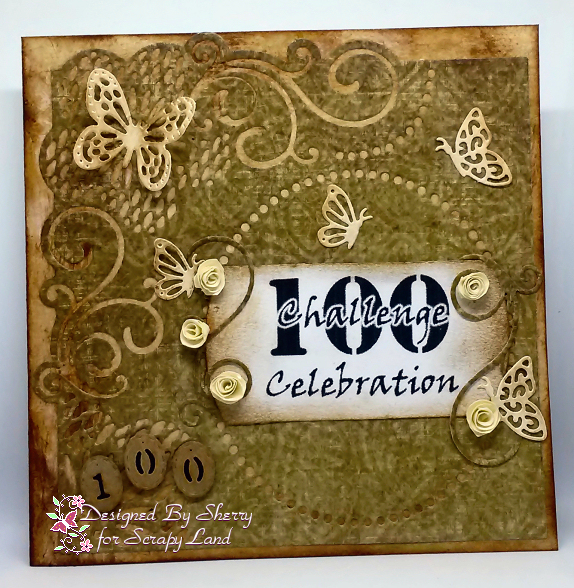 A wonderful card celebrating the 100th challenge. I love the vintage look of it. I love your style! Just beautiful! Love it, especially with the roses and the butterflies! A beautiful card for your celebration! Absolutely gorgeous frame die cut! Thanks so much for sharing this with us at Penny's! Wow love your vintage card. Thanks for joining us at Crafty Sentiments Designs this week. Beautiful - that background is perfect for your die cuts. Wow! Very elegant vintage card! Love so much the frame! Lovely card always hard to do a card for such a large number,very elegant,thanks for sharing your card with us here at Penny's Lyn DT x. Great card Sherry! How fun to be on the Team for this big event. Une bien belle carte de célébration pour le 100ème défi de Scrapy Land. 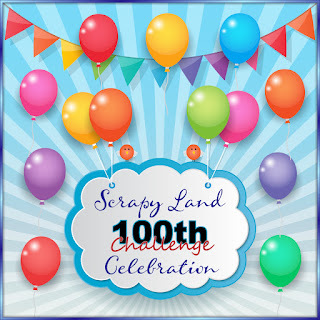 A beautiful card of celebration for the 100th challenge of Scrapy Land. Gorgeous project. Love that you used a vintage look and not one of these extreme colourful designs for celebrating the 100th challenge! wow what a gorgeous card - love everything about it!! That's fab! I love the lace frame and the pretty details. Beautiful colours, too. Do-Al(l) Kreatives I hope you’ll join us next time again. I like your card, specially the colours! great card for this special occasion! And I want this butterflies! 100 Challenges for Scrapyland! Amazing vintage approach! Love your project! I am inspired! Great idea going vintage for the 100th challenge.